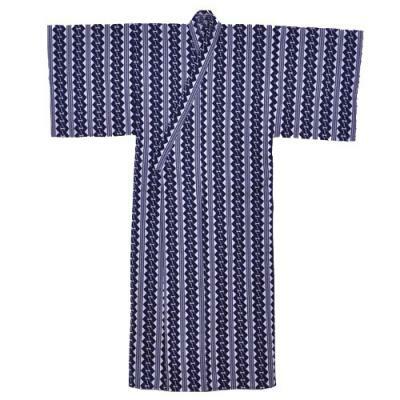 This Japanese yukata features a crisp navy blue and white eternal chain design. The eternal chain is symbolic of life, hope and strength. This men's yukata is made in Japan of 100% soft cotton with a shrink resistant finish. Yukata are perfect for use as loungewear, a robe or as a cover-up for the beach or pool. A matching belt is included. Machine wash cold water for best results. This yukata is available in four sizes: Small, Medium, Large and XL. Small, measures 56” in length and is designed to fit a male 5’ 4" to 5’ 8” in height. The sleeve length is 15”, the shoulder width is 27”, and the girth is 50”. Medium, measures 58" in length and is designed to fit a man 5' 6" to 5' 10" in height. The sleeve length is 15", shoulder width is 27", and the girth is 50". For shorter versions of yukata robes, please see our selection of happi coats. Just received the most gorgeous kimonos.